8 Best-Dressed Celebrity Brides Of All Times. 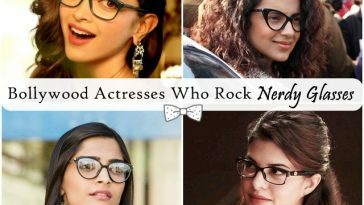 . .
Lifestyles and fashion trends of celebrities are always inspiring. Here are few best-dressed celebrity brides of all times. 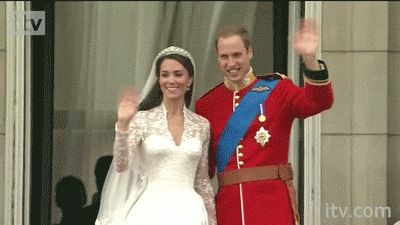 Prince William and Kate Middleton’s wedding was one of the most awaited weddings which took place in 2011. And surely she looked simply stunning in Alexander McQueen wedding gown that was a perfect integration of royal tradition and modernity. Sarah Burton who is creative director of Alexander McQueen designed the dress. It is reported that the dress cost approximately 250,000 Euros. George Clooney and Amal Alamuddin got married in Venice in September 2014 and she looked simply stunning. She had worn an Oscar de la Renta gown, which was very exquisite and was designed with 14 yards of Chantilly lace while the dress’s bodice was hand embroidered with crystals and beadings. The dress looks like it was white but in fact, the dress was cream colored. 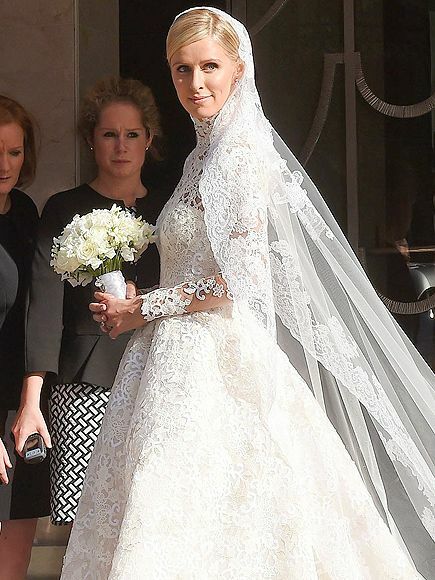 Nicky Hilton got married in 2015 and she did admit that she was highly inspired by Grace Kelly even though her dress drew comparisons with Kate Middleton’s. She wore a Valentino dress, which was classically traditional, had beautiful white lace and made her look very stunning. Angelina’s wedding dress was unique and was created by Atelier Versace head tailor Luigi Massi. 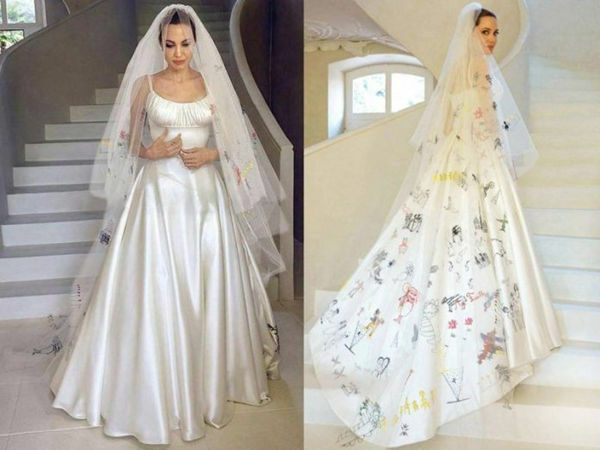 Her dress was very iconic and is remembered as Brad and Angelina’s children covered her veil in a pattern of doodles that were designed. The gown had a fine fitting bodice, thin straps, a plain flowing full skirt and a ruched bust. Kim Kardashian married Kanye West in 2014 and she wore a very beautiful gown, which was designed by Riccardo Tisci. The dress was long-sleeved lace designed, was sheer-inset Givenchy Haute Couture gown and had a long silk veil. 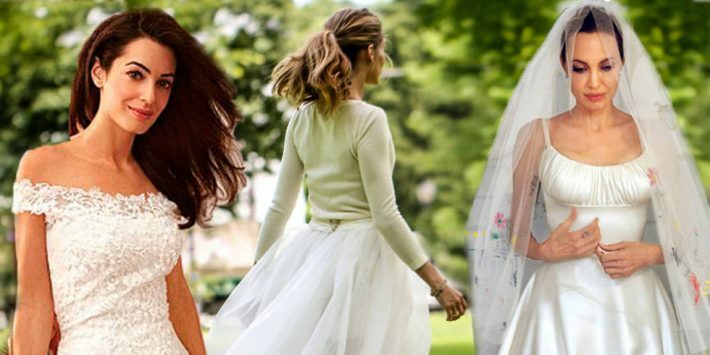 Her best friend Victoria Beckham designed Eva Longoria’s wedding dress. It was very simple yet very elegant. The dress was divine white colored, fitted gown and had a sweetheart neckline on tight bodice-fitted top. She looked very stunning in a plain white simple yet chic gown. 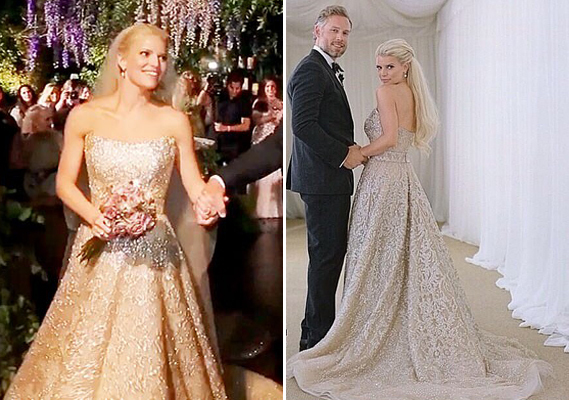 Jessica Simpson got married to Eric Johnson in 2014 and she had worn a Carolina Herrera gown for the occasion. She looked gorgeous in a gold and champagne embroidered dress, which looked very royal and was strapless. The skirt was A-lined and it flattered her figure perfectly. Jessica Biel married Justin Timberlake in 2012 in Fasano, Italy. Her dress was frothy, fuchsia pink colored designed by Giambattista Villa. 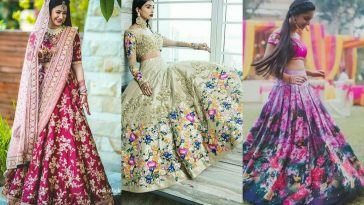 According to her, she was never crazy about a white colored wedding dress when the designer suggested pink colored one. She said it was a leap of faith kind of decision at that time and it did turn out to be very elegant and beautiful.